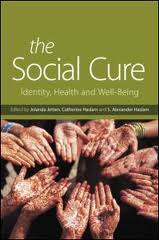 In July 2010 The Social Cure, edited by Jolanda Jetten, Catherine Haslam and Alex Haslam was published by Psychology Press. The book provides an analysis of the contribution of group memberships and associated social identities to health and well-being. The chapters cover a diverse array of topics and are written by experts in different branches of psychology (e.g., social, organizational, clinical, neuro) as well as cognate disciplines (gerontology, epidemiology, economics). Reviewing the book, Robert Putnam, Professor of Public Policy at Harvard, commented: "The Social Cure provides an impressive and diverse array of empirical evidence showing how pervasive these effects are. The incisive conclusion is packed with insights into the implications of this research for researchers, practitioners, and policymakers in many fields. Let's hope that these lessons are widely heeded." You can find out more, and also purchase the book at a reduced rate, here.